A small glimmer of hope this Christmas at Der Spiegel. Today the magazine's website published an interview on Iraq with the US Senate's Chairman of the Foreign Relations Committee, Republican Senator Richard Lugar. Make no mistake, these sorts of interviews with US conservatives are extremely rare in the German media. Typically, the "America experts" interviewed in Germany overwhelmingly represent the left-wing view of US politics. If SPIEGEL and other large German publications are truly serious about informing their readers about US politics and not simply taking advantage of anti-American stereotypes and fears, we need to see A LOT more interviews like this one. In particular, we need to see more interviews with Bush supporters to give the German people an unfiltered understanding of their worldview. If a transatlantic dialogue is to begin, both sides need to listen to what the other has to say. We at Medienkritik believe that it is possible to successfully challenge the German media and demand more fairness and balance. It is a fight worth fighting for anyone and everyone interested in improving transatlantic ties. Oh yeah! That "Blut für Öl" issue was classic SPEIGEL. As I recall, the cover article argued solely from plausiblities. You know, since the US imports oil, and Iraq has oil, it follows that any action the U.S. takes in Iraq is all about oil. The article failed to mention any other considerations, like the UN sactions Saddam ignored, the gassing of the Kurds, Saddam's interest in chemical, biological and nuclear weapons, etc. It was more like an Oliver Stone film than serious journalism. In the weeks following publication of the article, a number of German academics I know cited it as an excellent description how Bush was just after Iraq's oil. Any argument to the contrary, no matter how it was framed, led to stony silence; a real conversation killer. Interestingly enough, many months later SPIEGEL ran an article ridiculing the various 9/11 conspiracy theories that were, and remain, in vogue here in Europe. They failed, of course, to look at their own reporting. Yeah, its always the oil, stupid ! The simplest solution is always the right ! And the oil ist the simplest solution ! Why have the amis kicked Saddam out of Kuwait ? Why they do nothing against the anarchy in Somalia ? Because where is no oil ! Why did they finaly went to somalia ? Because where is oil ! Why they do nothing against the war in Bosnia ? Because where is no oil ! Why did they finaly went to Bosnia ? Because where is oil(pipeline) ! Why they do nothing against the Taliban ? Because where is no oil ! Why did they went to Afghanistan ? Because where is oil (pipeline) ! Question: If the Amaricans wanted the oil of Iraq, why they dind't buy it ? But you are dealing with a "nuanced" version of Occam's Razor here: The solution that makes America look bad is always the best solution. And looking over those covers again, the "Die Falle Irak: Bushs Vietnam" reminds me of a young German lady I was talking to just after the hostilities in Iraq resumed in March of 2003. She was so incensed by the US attempt to topple Saddam that she hoped Iraq would become "another Vietnam for America." I talked to her again after Saddam went into hiding, and after listing to her complain bitterly about the Americans in Iraq, I asked if she would prefer that Saddam return to power. A look of shock crossed her face, and after hestiating for a moment she replied, "Well...yes!" Now, we are actually talking about an otherwise very decent human being here, with whom I get along quite well. But most anyone who is bombarded night and day with anti-American propaganda is going to start believing it sooner or later. There may be some latent anti-Americanism in Europe - there has been for a long time - but the media here is largely responsible for the current sad state of affairs. Take another gander at those SPIEGEL covers. Look how polemical and provacative they are. That's not journalism as I would define the term. Americans love oil. Germans love mass graves and poison gas. "Americans love oil. Germans love mass graves and poison gas. Posted by: JKZeller | December 26, 2004 04:11 AM"
Actually that's a false assumption JKZ. If the Germans need to be reminded of unpleasant things, great, we remind them. But we need to hold down the rhetoric to the same level that they are cautioned about. I'm reminded of the German Navy who view things differently than the media. That cuts a sizeable chunk out of "All Germans". My point was to illustrate how dangerous gross generalizations can be and to serve a reminder that no one is as clean as they'd like to pretend. The print version of Der Spiegel has an advertisement for a German television station. It shows a photograph of an American soldier in Iraq holding a machine gun. A part of the machine gun has been cut away and superimposed on the gun is a gas pump nozzle in the opening of a gas tank on a car. What the ad fails to include in the photo is the EU symbol on the license plate of the car. I am glad to see that Der Spiegel would interview any conserative, but I wouldn't get too excited about the one they chose. Lugar is usually trotted out by the liberal media in the US when it wants to slam Bush. It's the media's way of saying, "See, even the Republicans hate Bush." To put it in perspective, he criticizes the Republicans, but doesn't have the clout, insight or respect that McCain has when he is critical. "The audience swooned and I considered, not for the first time, the real character of this indiscriminate America bashing. It's like what Michael Moore dishes up -- comfort food for people who want to feel good about feeling bad toward America. Droves of Europeans seem to be craving this junk. A writer for the German weekly Der Spiegel told me during the Iraq debate not to take offense at the crude anti-American covers of the magazine such as the ugly, bearded, drooling Rambo figure it used to show the typical GI in Iraq. "We're just trying to please our million readers," he explained. People lap it up and an army of teachers, editors, politicians, and writers keep delivering the goods." Viele Deutsche meinen, sie hätten gelernt, ohne Feindbilder zu leben und würden dies nun in der derzeitigen Situation praktizieren, während die Amerikaner immer noch Feindbilder im Kopf hätten. Durch Zufall (wirklich!) hörte ich heute morgen einen Satz aus der Predigt im ZDF. Die Pastorin führte aus, daß man Feindbilder überwinden müsse usw. Dann sprach sie über Rumsfeld a b f ä l l i g e Bemerkung übers a l t e Europa und meinte, wir seien doch stolz auf dieses alte Europa. Hat Rumsfeld dies wirklich a b f ä l l i g gesagt und gemeint?! Ich habe das ganz anders aufgefaßt, den Zusammenhang gesehen, daß er nur schnell eine Frage eines Journalisten beantwortet hat. Daraus hat man ein R i e s e n theater konstruiert. Überall in allen Medien bis heute, bis hinein in diese Predigt dieser Pastorin hieß es dann, dieser arrogante Rumsfeld, der sich da so äbfällig äußert. Warum wird dies von so vielen so kritiklos übernommen? Das ist ebenfalls die Erschaffung von Feindbildern, nur, diese Frau erkennt ihre eigene fehlerhafte Haltung nicht. Ein kleines Beispiel nur, aber es schockte mich doch, daß diese kleine Bemerkung unsere Gesellschaft durchdrungen hat wie ein Giftwurm. Rumsfelds kleiner Satz wird millionenfach vergrößert und verbreitet, seine angebliche Abfälligkeit wird zur Wahrheit. Für mich zeigt diese Pastorin, daß sie Feindbilder als schädlich kritisiert und im nächsten Satz selbst zeigt, wie sie selbst dem neuen Feindbild erlegen ist und hilft, es weiterzuverbreiten. Keine Feindbilder zu haben sollten wir auch auf die USA und Israel beziehen. Wenn sich Schröder am alten Feind Frankreich anschmiegt, dann doch nur auf Kosten des neuen Feindes USA und Israel. European cars on green salad! "SZ-Magazin: Herr Gruen, wir Deutsche haben George W. Bush zu unserem neuen Feindbild erkoren. Wem rät ein Psychoanalytiker eher zu einer Therapie: den Deutschen oder George W. Bush? Arno Gruen: Bitte lassen Sie mich differenzieren: Bush ist tatsächlich ein Feind für die Menschheit; weil er einen Krieg führt unter Vorspiegelung falscher Tatsachen, weil er arrogant und völkerverachtend ist – wie Hitler übrigens." @Tina: I was going to also question Sen Lugar's conservative credentials. I checked the ACU (American Conservative Union) webpage http://acuratings.com/acu.cgi?ACT=1&USER_ID=2836&YEAR=2003, they rate every legislator on a liberal to conservative scale. With 0 being pure liberal and 100 being pure conservative, Lugar comes out with a 79 lifetime rating. That's a lot better than I thought. Tina, I think your point is also true, is that Lugar, like many Republicans, only gets media coverage, when they criticize other Republicans. I'll have to read this interview, to see what Lugar says. No one considers him a leading spokesman for conservative ideas. Lesen wir mal richtig: Westeuropa fühlt sich seit 50 Jahren in der Rolle des unmündigen Kindes gegenüber den USA, dem Übervater! Arno Gruen: Alle Feindbilder beruhen auf Hass. Sie haben nie mit der Wirklichkeit zu tun, sondern mit der Entwicklung, die viele von uns als Kind durchmachten: In westlichen Kulturen wird es auch heute noch als unumstößliche Wahrheit angesehen, dass ein Kind dazu gebracht wird, sich dem Willen der Eltern zu unterwerfen. So wird der Gehorsam tief in der menschlichen Seele verankert und die eigenen Bedürfnisse und Wahrnehmungen des Kindes zum Feind. Das Eigene wird zum gehassten Fremden. Arno Gruen: Aber genau so entstehen Feindbilder: Der Feind, den wir in anderen zu sehen glauben, muss ursprünglich in unserem Inneren zu finden sein. Man hasst sich selbst für die wahre Liebe, die man braucht. Hass bedeutet immer Selbsthass. Und deshalb sucht man da draußen Feindbilder, um andere niederzumachen. Nur so können wir aufrecht gehen. Feindbilder sind in diesem Sinne immer etwas Irrationales, der Hass aber ist real. "Europa, der alte mächtige weltbeherrschende Kontinent hasst sich selbst im feindbild USA"
"Dan Diner hat in seiner Studie Feindbild Amerika gezeigt, wie Europa Amerika seit zweihundert Jahren als Projektionsfläche benutzt, um Eigenschaften, die es an sich selbst nicht wahrhaben will, aus dem eigenen Bewußtsein abzuspalten. So gilt Amerika als Hort des Kapitalismus, der Raffgier, des Rassismus, der religiösen Bigotterie und der entfesselten Gewalt nach innen wie nach außen." If America went into Iraq to "steal" the oil then why didn't we steal the Kuwaiti's oil in 1991? Why let that opportunity go by only to have to spend a hell of a lot more money a decade later to accomplish that same goal? That said, neither would I want to claim that the Iraq war has absolutely nothing to do with oil at all in this post 9/11 world. (Although there were numerous reasons ranging from suspected WMD's to humanitarian reasons to preserving some legitimacy for the UN, which had issued so many SC resolutions which this one dictator was flouting with impunity.) With regard to oil, however, it is fairly clear that the radical Islamists would like to seize the ME oil fields in order to hold the world hostage to oil and destroy the economies of the west. UBL said so himself recently. Many people don't seem to realize that given the interdependent world economies under globalization - if the west goes down - the world's 3rd world economies would be literally devastated. They would go down 1st. So it wouldn't surprise me if one among many reasons we went into Iraq was to in some sense "secure" (not "steal") the oil in order to prevent a global economic catastrophe that would result in much suffering for everyone. If that is indeed the case, is there something wrong with that? (you'll have to cut and paste - unless someone would be so kind as to provide a bona fide link). Apparently this Mr Barnett has been giving regular briefings on his ideas to military brass at the Pentagon and is becoming quite influential. His book The Pentagon's New Map is gaining a wide audience in the US (He was on C-Span last weekend and the interview was re-run several times). What I find interesting about his analysis of the "Core" vs the "Gap" (Saddam's Iraq clearly lying in the Gap) - is that it clearly shows that economic and humanitarian issues are inextricably LINKED - and that information flow plays a particularly important role in bringing societies into the "Core". Large-scale violence and oppression regularly occur in the Gap rather the Core. So this simplistic idea that one can divorce economic and humanitarian issues is quite naive. AND WHY WE’LL KEEP GOING TO WAR. Of course I'm sure that if the US fails to take charge of global security, the radical Islamists would be more than happy to step up to the plate. -If you aim at robbing oil you should have established a second Saddam or another tyrant who is willing to deal with his prey he himself stole from his own people. Whereas democracy means transparency, i.e. presupposes or creates an economy with at least less bribes, kickbacks and corruption. As long as the LAW is ruling a country, not private and arbitrary use of personal power there will be a system of checks and investigation, preventing outlaws from exploiting Arab societies. -The Sunnis have nearly no oil; but given: free access to oil was the only goal America strove for, why didn´t she sever the southern and the northern part from the Iraq, building a huge fence around the oil areas guarded by marines, Kurds and Shiites, leaving the useless rest to al-Zarkawi and his friends? -After 1991 US oil companies were able to sign several contracts with former Soviet republics; this means more oil is now available: In 1991 the US withdrew from southern Iraq with less oil being available, so why the heck should America go in NOW? -Besides: "No oil for blood" was the slogan of the extreme right AND left in Germany during the Ruhrbesetzung or the Ruhrkampf in the aftermath of WW I. The KPD and the forerunners of the NSPAD directed this accusation against GB that had colonial energy interests or stakes in the Arab world forcing subsequently France to search energy elsewhere, i.e. in the Ruhrgebiet. Today, once again, the extreme right, the extreme left AND our Neue Mitte (liberals, New Left, New Politics) rally around this same slogan: Whenever Germany is battling with America, we tend to battle with our history and this does not always mean we are doing this sincerely or even decently drawing the appropriate conclusions from it. Sad but true. Speaking of modern times, and the public's illusions: Europe uses immense amounts of oil, as does the rest of civilization. This notion that US policy is solely based on energy, and that no other nation has to worry about energy is disingenuous and simplistic. After all where would Russia, Norway, and Britain be if we all somehow stopped using oil tomorrow? Der Spiegel is now online in English and I think it might be interesting to monitor their content on both English and German language sites. As I blogged, I doubt my German is up to the task but figured you would be on the lookout for any discrepancies. Thanks for the great stuff. "I'm going to have to keep an eye on this gem of a blog." "David's Medienkritik is an essential read for a perspective on the European media." "By the way, Medienkritik is an excellent blog, and so I am adding it to the Daily Pundit blogroll." "I applaud David for his stance against the trashy media here in Germany"
"Ausgezeichneter Blog, Glückwunsch! Habe sofort gebookmarkt. Ich dachte schon, ich sei der einzige, der unter der Käseglocke der deutschen Medienlandschaft erstickt... der Blog ist wie ein Hauch frischer Luft, keep up the good work!" 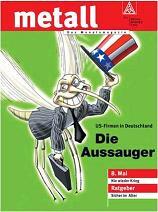 German Media: Will Anti-Americanism Disappear? SPIEGEL: "We're Just Trying to Please Our Million Readers." 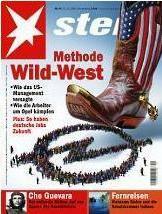 Stern Magazine: "How America Lied to the World"
Stern on Condoleezza Rice: "The Voice of Her Master"
Stern: "America is Destroying the West"
SPIEGEL Disses Obama Again: "Europe Must Protect Itself from America"
SPIEGEL's Marc Pitzke Declares GHW Bush Dead - But Hold the Phone!